This kraken has matured into a ferocious adult. Its tentacles have elongated to astonishing lengths, and its beak has grown sharp and extremely dangerous. It feeds on large fish, and will wrap around its prey before devouring it. In its adult form, a kraken spends most of the day lying deep underwater, watching all that occurs from the shadows. Spending most of its time in oceans and seas, it returns to Lake Lakira to sleep and visit with its magi. 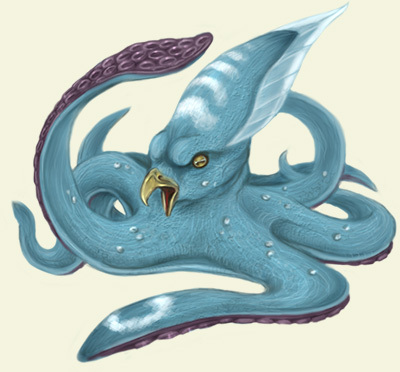 On any watery quest, a kraken is a good companion, making any beast that comes near think twice about attacking. Krakens are extremely difficult to find, and are rarely discovered in streams or rivers. A magi must travel to the depths of oceans and seas to find such an egg, and the journey is often perilous and full of danger. They have the strongest water powers of any animal known, capable of causing massive floods or storms. They have eight large tentacles, and can grow to be two tons or more in weight. A kraken makes a formidable ally, and will even carry their owner across oceans.